David JW Grant NIPTE Distinguished Scholar Award in Basic Pharmaceutics – The National Institute for Pharmaceutical Technology & Education, Inc.
Dale Eric Wurster received his B.S. Degree (Chemistry) from the University of Wisconsin (Madison) in 1974. The Ph.D. Degree (Industrial and Physical Pharmacy) was granted in 1979 by Purdue University. Upon graduation, Wurster joined the faculty of the University of North Carolina (Chapel Hill) as an Assistant Professor. Since 1982 he has been on the faculty of the University of Iowa (Division of Pharmaceutics and Translational Therapeutics). He was promoted to Associate Professor in 1987 and to Professor in 1996. From 2006 to 2012 he was also a Professor in the Department of Chemical and Biochemical Engineering. 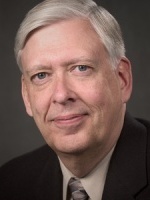 In addition to his faculty responsibilities, he has been the Associate Dean for Academic Affairs of the University of Iowa Graduate College (Jan. 1, 2002 – July 31, 2009) and the Senior Associate Dean of the University of Iowa Graduate College (Aug. 1, 2009 – June 30, 2015). Wurster is the author or co-author of over 200 peer-reviewed abstracts and research articles, and he has served as major professor for 32 Ph.D. graduates. He is currently directing the dissertation research of 2 Ph.D. students. Wurster’s research largely comes under the heading of Materials Science. As such, it has contributed to the basic science underpinning oral solid dosage form fabrication and quality, as well as to the areas of adsorption-desorption behavior and adsorbent surface characterization. Analytical techniques which figure prominently in his research are: isoperibol calorimetry, compression calorimetry, differential scanning calorimetry, Fourier-transform Infrared Spectroscopy (FTIR), computer modelling, dynamic vapor sorption, and X-ray photoelectron spectroscopy (XPS). Financial support has come from the Department of Defense, the National Institute on Drug Abuse, and the pharmaceutical industry. Wurster is currently serving a three-year term as President Elect (2018), President (2019), and Past President (2020) of the American Association of Pharmaceutical Scientists (AAPS). Additionally, he is an AAPS Fellow (1998) and the recipient of an AAPS Research Achievement Award in Manufacturing Science and Engineering (2009). He was named a Distinguished Alumnus of the Purdue University College of Pharmacy in 2015, and, in 2017, he was presented with the Ralph Shangraw Memorial Award by the IPEC Foundation. Wurster was Chair of the Faculty Committee (July 2017- June 2018) of the National Institute for Pharmaceutical Technology and Education (NIPTE). He also served a term on the Scientific Advisory Board for the Engineering Research Center for Structured Organic Particulate Systems (NSF, 2008 – 2011). Wurster has served on various committees of the United States Pharmacopeia for 23 years (1995-2018), and has served on various committees of the National Association of Boards of Pharmacy for 36 years (1982-2018).